Recently I discovered Hack The Box, an online platform to hone your cyber security skills by practising on vulnerable VMs. The first box I solved is called Access. In this blog post I’ll walk through how I solved it. If you don’t want any spoilers, look away now! Let’s start with an nmap scan to see what services are running on the box. nmap has found three services running: FTP, telnet, and an HTTP server. Let’s see what’s running on the HTTP server. It’s just a static page, showing an image. Nothing interesting, so let’s move on for now. We’ve got a .mdb file—which is a Microsoft Access database file—and a zip file. If we take a quick look at the zip file it’s password protected. We’ll have to come back the that later. We can examine backup.mdb using MDB tools. Maybe there’s something we can use there. It looks like there’s a lot of autogenerated tables here, but those auth_* tables look interesting. Awesome! 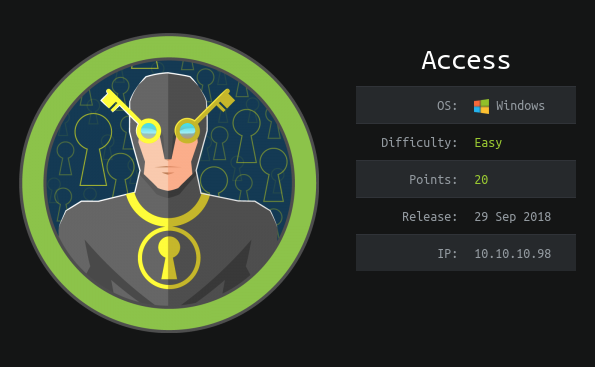 So we’ve got some credentials for engineer, and we’ve got a password protected zip file in the Engineer directory. That worked! Now we’ve got the mailbox backup for the engineer, but we first need to convert it to something that we can read more easily on Linux. "Access Control" - 2 items done, 0 items skipped. ed on to your engineers. 331 Password required for security. No dice ☹. The only other option is telnet. 02/02/2019  03:56 PM    <DIR>          . 02/02/2019  03:56 PM    <DIR>          ..
08/28/2018  06:51 AM    <DIR>          . 08/28/2018  06:51 AM    <DIR>          ..
Now that we’ve got the first flag, we need to escalate to root access—or more specifically Administrator on Windows. The .yawcam directory looks out of the ordinary. 08/24/2018  07:37 PM    <DIR>          . 08/24/2018  07:37 PM    <DIR>          .. However poking around in there proved fruitless. Maybe there’s a way to use this, but I couldn’t figure anything out. 02/02/2019  04:15 PM    <DIR>          . 02/02/2019  04:15 PM    <DIR>          ..
Maybe one of the other users has something interesting we can use? 02/02/2019  04:14 PM    <DIR>          . 02/02/2019  04:14 PM    <DIR>          .. Wait a minute, we’re missing some of the standard Windows directories. Let’s have a closer look. That’s because there’s a shortcut there. Now, I’m not sure of the best way to view a .lnk on cmd.exe via telnet, but this is what I came up with. If anyone knows of a better way, please let me know! It’s a bit difficult to read, but it looks like the shortcut runs a program as the Administrator using saved credentials. We can use that. C:\Users\Public\Desktop>runas /user:Administrator /savecred "cmd.exe /c more C:\Users\Administrator\Desktop\root.txt > C:\Users\Public\Desktop\output.txt"
Yes! From there we could generate a reverse shell using msfvenom and run that as Administrator, but I’ve got the flag so I’ll leave it there for now. Have you ever tweeted out a hastag, and discovered a small image attached to the side of it? It could be for #StPatricksDay, #MarchForOurLives, or whatever #白白白白白白白白白白 is meant to be. These are hashflags. If you’re a company, and you have enough money, you can buy your own hashflag as well! That’s exactly what Disney did for the release of Star Wars: The Last Jedi. If you spend the money to buy a hashflag, it’s important that you launch it correctly—otherwise they can flop. #白白白白白白白白白白 is an example of what not to do. At time of writing, it has only 10 uses. Hashflags aren’t exclusive to English, and they can help add context to a tweet in another language. I don’t speak any Russian, but I do know that this image is of BB-8! Unfortunately hashflags are temporary, so any context they add to a tweet can sometimes be lost at a later date. Currently Twitter doesn’t provide an official API for hashflags, and there is no canonical list of currently active hashflags. @hashflaglist tracks hashflags, but it’s easy to miss one—this is where Azure Functions come in. It turns out that on Twitter.com the list of currently active hashflags is sent as a JSON object in the HTML as initial data. All I need to do is fetch Twitter.com, and extract the JSON object from the HTML. I wrote some C# to parse and extract the activeHashflags JSON object, and store it in an Azure blob. You can find it here. Using Azure Functions I can run this code on a timer, so the Azure blob is always up to date with the latest Twitter hashflags. This means the blob can be used as an unofficial Twitter hashflags API—but I didn’t want to stop there. I wanted to solve some of the issues with hashflags around both discovery and durability. Azure Functions is the perfect platform for these small, single purpose pieces of code. I ended up writing five Azure Functions in total—all of which can be found on GitHub. ActiveHashflags fetches the active hashflags from Twitter, and stores them in a JSON object in an Azure Storage Blob. You can find the list of current hashflags here. UpdateHashflagState reads the JSON, and updates the hashflag table with the current state of each hashflag. StoreHashflagImage downloads the hashflag image, and stores it in a blob store. CreateHeroImage creates a hero image of the hashtag and hashflag. TweetHashflag tweets the hashtag and hero image. 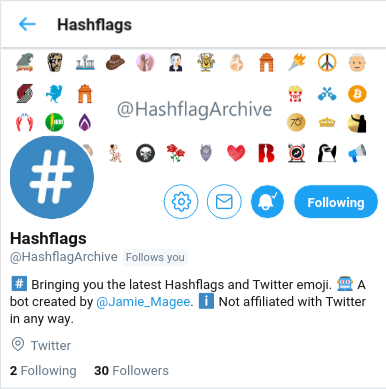 @HashflagArchive solves both the issues I have with hashflags: it tweets out new hashflags the same hour they are activated on twitter, which solves the issue of discovery; and it tweets an image of the hashtag and hashflag, which solves the issue of hashflags being temporary. So this is great, but there’s still one issue—how to use hashflags outside of Twitter.com and the official Twitter apps. This is where the JSON blob comes in. I can build a wrapper library around that, and then using that library, build applications with Twitter hashflags. So that’s exactly what I did. I wrote an npm package called hashflags. It’s pretty simple to use, and integrates nicely with the official twitter-text npm package. I wrote it in TypeScript, but it can also be used from plain old JS as well. So there you have it, a quick introduction to Twitter hashflags via Azure Functions and an npm library. If you’ve got any questions please leave a comment below, or reach out to me on Twitter @Jamie_Magee. In part one of this article, I collected robots.txt from the top 1 million sites on the web. In this article I’m going to do some analysis, and see if there’s anything interesting to find from all the files I’ve collected. First we’ll start with some setup. Next I’m going to load the content of each file into my pandas dataframe, calculate the file size, and store that for later. Now that we’ve done the setup, let’s see what the spread of file sizes in robots.txt is. It looks like the majority of robots.txt are under 250KB in size. This is really no surprise as robots.txt supports regex, so complex rulesets can be built easily. Let’s take a look at the files larger than 1MB. I can think of three possibilities: they’re automatically maintained; they’re some other file masquerading as robots.txt; or the site is doing something seriously wrong. It looks like all of these sites are misusing Disallow and Allow. In fact, looking at the raw files it appears as if they list all of the articles on the site under an individual Disallow command. I can only guess that when publishing an article, a corresponding line in robots.txt is added. Disallow: / tells all webcrawlers not to crawl anything on this site, and should (hopefully) keep it out of any search engines, but not all webcrawlers follow robots.txt. User agents can be listed in robots.txt to either Allow or Disallow certain paths. Let’s take a look at the most common webcrawlers. It’s no surprise that the top result is a wildcard (*). Google takes spots 2, 4, and 6 with their AdSense, search and image web crawlers respectively. It does seem a little strange to see the AdSense bot listed above the usual search web crawler. Some of the other large search engines’ bots are also found in the top 10: Yandex, Baidu, and Yahoo (Slurp). MJ12bot is a crawler I had not heard of before, but according to their site it belongs to a UK based SEO company—and according to some of the results about it, it doesn’t behave very well. ia_archiver belongs to The Internet Archive, and (I assume) crawls pages for the Wayback Machine. Finally there is Apache Nutch, an open source webcrawler that can be run by anyone. There are certain paths that you might not want a webcrawler to know about. For example, a .git directory, htpasswd files, or parts of a site that are still in testing, and aren’t meant to be found by anyone on Google. Let’s see if there’s anything interesting. Just because a file or directory is mentioned in robots.txt, it doesn’t mean that it can actually be accessed. However, if even 1% of Wordpress installs leave their install.php open to the world, that’s still a lot of vulnerable sites. Any attacker could get the keys to the kingdom very easily. The same goes for a .git directory. Even if it is read-only, people accidentally commit secrets to their git repository all the time. robots.txt is a fairly innocuous part of the web. It’s been interesting to see how popular websites (ab)use it, and which web crawlers are naughty or nice. Most of all this has been a great exercise for myself in collecting data and analysing it using pandas and Jupyter. After reading CollinMorris’s analysis of favicons of the top 1 million sites on the web, I thought it would be interesting to do the same for other common parts of websites that often get overlooked. The above excerpt tells all web crawlers not to scan the /search path, but allows them to scan /search/about and /search/howsearchworks paths. There are a few more supported keywords, but these are the most common. Following these instructions is not required, but it is considered good internet etiquette. If you want to read more about the standard, Wikipedia has a great page here. In order to do an analysis of robots.txt, first I need to crawl the web for them – ironic, I know. I wrote a scraper using scrapy to make a request for robots.txt for each of the domains in Alexa’s top 1 million websites. If the response code was 200, the Content-Type header contained text/plain, and the response body was not empty, I stored the response body in a file, with the same name as the domain name. The rest of the scraper itself is quite simple, but you can read the full code on GitHub. 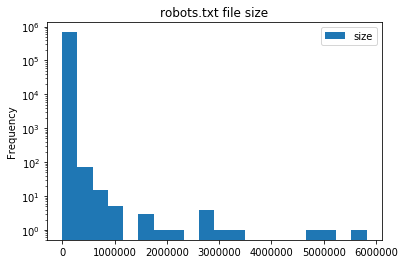 The smallest robots.txt was 1 byte1, but the largest was over 5MB. In the next part of this blog series I’m going to analyse all the robots.txt to see if I can find anything interesting. In particular I’d like to know why exactly someone needs a robots.txt file over 5MB in size, what is the most common web crawler listed (either allowed or disallowed), and are there any sites practising security by obscurity by trying to keep links out of search engines! Late last year I set about building a new NAS to replace my aging HP ProLiant MicroServer N36L (though that’s a story for a different post). I decided to go with unRAID as my OS, over FreeNAS that I’d been running previously, mostly due to the simpler configuration, ease of expanding an array, and support for Docker and KVM. Docker support makes it a lot easier to run some of the web apps that I rely on like Plex, Sonarr, CouchPotato and more, but accessing them securely outside my network is a different story. On FreeNAS I ran an nginx reverse proxy in a BSD jail, secured using basic auth, and SSL certificates from StartSSL. Thankfully there is already a Docker image, nginx-proxy by jwilder, which automatically configures nginx for you. As for SSL, Let’s Encrypt went into public beta in December, and recently issued their millionth certificate. There’s also a Docker image which will automatically manage your certificates, and configure nginx for you - letsencrypt-nginx-proxy-companion by jrcs. Firstly, you need to set up and configure Docker. 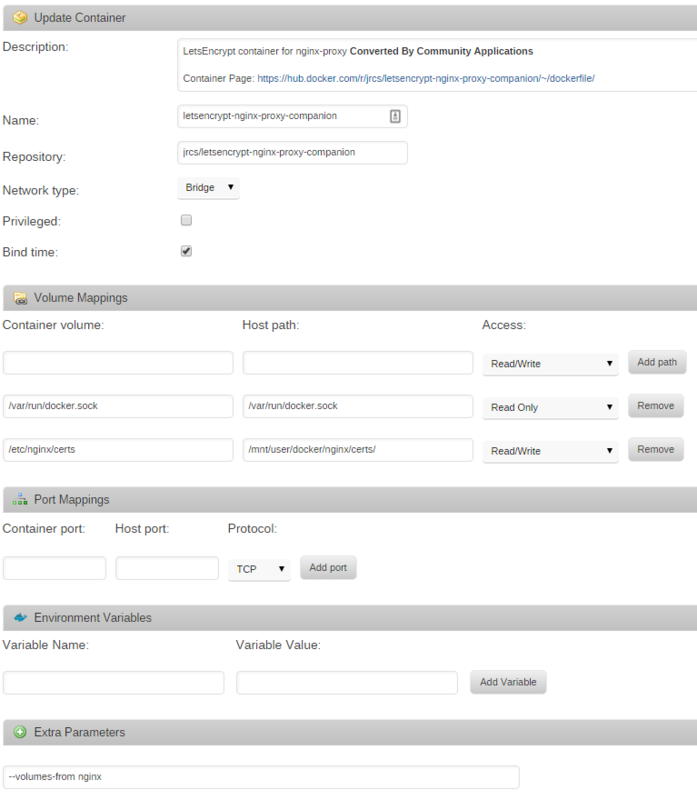 There is a fantastic guide on how to configure Docker here on the Lime Technology website. Next, you need to install the Community Applications plugin. 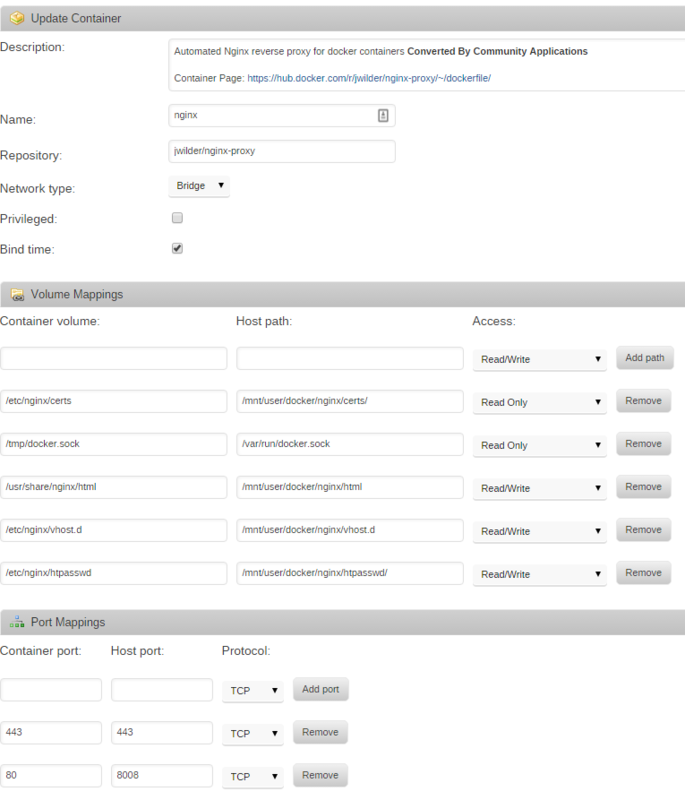 This allows us to install Docker containers directly from the Docker Hub. 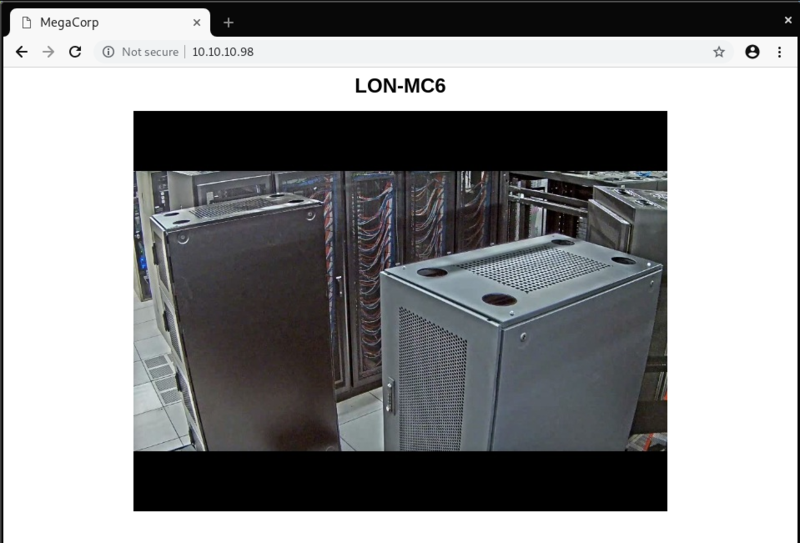 In order to access everything from outside your LAN you’ll need to forward ports 80 and 443 to ports 8008 and 443, respectively, on your unRAID host. In addition, you’ll need to use some sort of Dynamic DNS service, though in my case I bought a domain name and use CloudFlare to handle my DNS. To add basic auth to any of the sites you’ll need to make a file with the VIRTUAL_HOST of the site, available to nginx in /etc/nginx/htpasswd. For example, I added a file in /mnt/user/docker/nginx/htpasswd/. You can create htpasswd files using apache2-utils, or there are sites available which can create them. In order to configure nginx, you’ll need to add four environment variables to the Docker containers you wish to put behind the reverse proxy. They are VIRTUAL_HOST, VIRTUAL_PORT, LETSENCRYPT_HOST, and LETSENCRYPT_EMAIL. VIRTUAL_HOST and LETSENCRYPT_HOST most likely need to be the same, and will be something like subdomain.yourdomain.com. VIRTUAL_PORT should be the port your Docker container exposes. For example, Sonarr uses port 8989 by default. LETSENCRYPT_EMAIL should be a valid email address that Let’s Encrypt can use to email you about certificate expiries, etc. Once nginx-proxy, letsencrypt-nginx-proxy-companion, and all your Docker containers are configured you should be able to access them all over SSL, with basic auth, from outside your LAN. You don’t even have to worry about certificate renewals as it’s all handled for you.